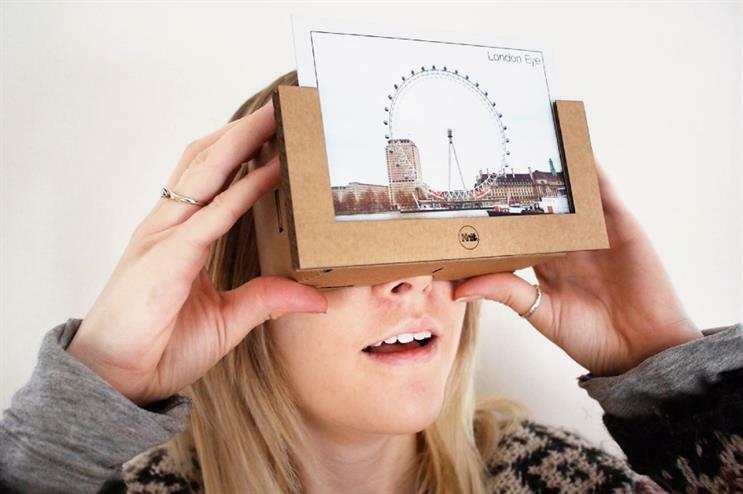 Creative technology agency Knit has created Cardboard Objects, an extension to virtual reality (VR) headset Google Cardboard. The Cardboard Objects project features cardboard additions that attach to the current device, offering new experiences in a VR environment. This means users will be able to explore more of a virtual world than just panning, extending the timeframe of the experience beyond the current five minutes. Knit has developed four objects including The Postcard, Trading Cards, Character and The Key. The latter gives users the option to unlock secret areas or objects within the experience, while Character does the same with digital personalities. The Postcard will transport the wearer to a location depicted on the cardboard and Trading Cards have been designed as collectable objects that can add an extra level of depth to a VR game. Nick Thompson, founding partner of Knit, said: "After the initial hype surrounding VR, the launch of Oculus Rift and now Google Cardboard has been a game changer. VR has become refined, usable and affordable to the masses. "It now offers brands the opportunity to truly immerse the consumer in the product and brand experiences." Knit was acquired by experience design company Foolproof last month (16 January).